The Feast of the Resurrection is a wonderful time for making new Christians! At St. John's we had 4 baptisms last night at our Vigil Service - the first time at the vigil we have had them since my arrival at St. John's (we have usually done a large number of them on "low Sunday" the week after). Matthew Reichhart, Shane Boehm, Melissa Cook and James Cook are our newest members of the body of Christ (two babies, a 5 year old, and an adult). In Rome even the Pope took time to remind the world the Resurrection is about conversion. VATICAN CITY--Italy's most prominent Muslim, an iconoclastic writer who condemned Islamic extremism and defended Israel, converted to Catholicism Saturday in a baptism by the pope at a Vatican Easter service. Jesus Christ is the ONLY name under heaven by which we can be saved. Basic teaching of Jesus, as found in the Scriptures. Jesus' earliest converts were Jewish. Many of the Church's earliest converts were Jewish. Jewish people should not be discriminated against by not receiving the opportunity to be saved, which, as I started above, is only through Jesus. Is it for those who are outside the Faith, to tell Christians how to practice the faith? The Faith as given by Jesus Christ - who died for Jew and Gentile. Let us pray likewise for God's chosen people: that the Lord our God may look graciously upon them and that they may come to acknowledge Jesus Christ our Lord as the redeemer of all mankind. Let us pray. Let us bow the knee. (Silence). Arise. Almighty and everlasting God, who didst give thy promises to Abraham and his seed, hear, we pray thee, the prayers of thy Church that the people chosen by thee of old may come to the fullness of redemption. Through Christ our Lord. Amen. ...even the death of the cross. Last night I was up later than usual, praying and pondering about the happenings in ECUSA. This morning I got up and prayed and worked out, with it still on my mind. So I had some horse therapy. 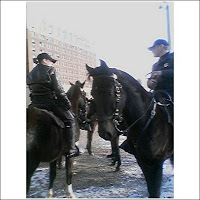 Met up with the Wayne County Sheriff's Mounted Unit in front of the Masonic Temple (a few blocks from St. John's). 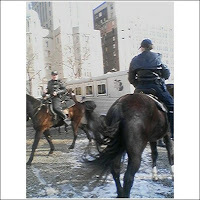 They were on a turn-out to get the horses (and riders) re-acclamated to downtown noises and sizes in preparation for baseball Opening Day in two weeks. They will come down a few more times before the big day. Being with horses is good therapy for me. I repeat that to my children frequently!! Perhaps the House of Bishops needs to hear it too. What Bishops Cox and Schofield might have done might have been wrong - but that doesn't give the HoB and the Presiding Bishop the ability to not follow the Canons either. Slightly more than one-third of all bishops eligible voted to depose bishops John-David Schofield and William J. Cox during the House of Bishops’ spring retreat, far fewer than the 51 percent required by the canons. The exact number is impossible to know, because both resolutions were approved by voice vote. Only 131 bishops registered for the meeting March 7-12 at Camp Allen, and at least 15 of them left before the business session began on Wednesday. There were 294 members of the House of Bishops entitled to vote on March 12. When questioned about canonical inconsistencies during a telephone press conference at the conclusion of the meeting, Bishop Michael Curry of North Carolina said the bishops had relied on advice provided to them by canonical experts, and did not examine canonical procedure during plenary debate prior to the votes to depose bishops Schofield and Cox. Bishop Schofield was consecrated Bishop of San Joaquin in 1989. Last December, he presided over a diocesan convention at which clergy and lay delegates voted overwhelmingly to leave The Episcopal Church and affiliate with the Anglican Church of the Southern Cone. Bishop Cox was consecrated Bishop Suffragan of Maryland in 1972. He resigned in 1980, later serving as Assisting Bishop of Oklahoma from 1980 to 1988. In 2005, Bishop Cox ordained two priests and a deacon at Christ Church, Overland Park, Kan. Christ Church affiliated with the Anglican Church of Uganda after purchasing its property from the Diocese of Kansas. Both bishops were charged with abandonment of communion. The procedure for deposing a bishop under this charge is specified in Title IV, canon 9, sections 1-2. The canon stipulates that the vote requires “a majority of the whole number of bishops entitled to vote,” not merely a majority of those present. At least a dozen bishops voted either not to depose Bishop Schofield or to abstain, according to several bishops. The number voting in favor of deposing Bishop Cox was reportedly slightly larger than the number in favor of deposing Bishop Schofield. Presiding Bishop Katharine Jefferts Schori was questioned about the history of the canonical proceedings against Bishop Cox. At first she said during the press conference that she had not sought the canonically required consent of the three senior bishops of the church for permission to inhibit Bishop Cox pending his trial. However Title IV, Canon 9, sections 1-2 do not describe a procedure for deposing a bishop who has not first been inhibited. DETROIT -- One week of living in Detroit and volunteering in some of its neediest neighborhoods was all it took to convince Brittany Betham that she has a stake in the city's future and the power to make some positive changes. A native of suburban Livonia with little exposure to Detroit beyond the theater district, Betham's choice to spend her freshman-year spring break in the city was such an eye-opening adventure that she's returned three times. "I didn't come into this experience thinking we are going to save the city," said Betham, 21, taking a break from constructing a sculpture for a local elementary school. "But we do help out in a small way. "It's not so much that we change the city, it's that 40 new people come away feeling connected to the city and want to help out in the future." Betham and the 39 other Wayne State University students this week have been cleaning, painting and volunteering throughout Detroit as part of the university's alternative spring break program. It's the program's fifth year, and unlike other college alternative spring break programs where students travel to places like New Orleans to help, Wayne State students always stay put, believing there's much support they can offer to their own city. This year, they were joined by students from University of North Carolina, Chapel Hill, who braved snowstorms and highway spinouts to come here, spending their spring break volunteering in Detroit and Dearborn. Their goal: trying to make the community a bit better "one step at a time, one flier, one trash bag at time," said Imani Jamal, a Wayne State sophomore from Detroit, after canvassing a neighborhood with fliers on home improvement loans and grant opportunities. Wayne State students must apply to the program. They pay a $65 participation fee and agree to live in the basement of a local church for the week, sleeping on the floor. They spend their mornings learning about the city and its crime, blight and homeless problems. By the afternoon, they've flocked to food banks, neighborhood community groups, burned-down houses and youth centers, hoping to make a positive impact. Many of the students are strangers and come from vastly different backgrounds -- cities and rural townships. Black and white. Male and female. "The one thing they have in common is they want to do volunteer work," said Tiny Sebastian, Wayne State adviser for alternative spring break. Alternative spring break programs are becoming increasingly popular, as more students choose building homes and cleaning up parks over basking in the sun in a warmer location. More than 50,000 college students are expected to participate in alternative spring break this year -- setting a record, said Jill Piacitelli, executive director of Break Away: The Alternative Break Connection. Michigan colleges remain one of the strongest, if not the strongest, group in the nation for using alternative spring break to promote positive citizenship and leadership, Piacitelli said. But Wayne State is unique by focusing exclusively on its own backyard, she said. "Alternative spring break is a little bit of a trick," Piacitelli said. The trip is designed to "galvanize you and give you an understanding of social issues." But the big point is when you get back to your own community, you have the tools and motivation to help out there, she said. "If Wayne State is skipping the middle step, then, all the better," she said. "The trip is the trick to get people interested in their own communities. The break fails if it doesn't translate back home." Shannon Montgomery had such a positive experience with Wayne's alternative spring break last year, she returned again this week as one of the group leaders. "I think the most rewarding thing for me was when we were cleaning out the burnt-out house," said Montgomery, 19. She lives near the Forest Arms apartment complex in Detroit that caught fire this winter. "I know a lot of people who have been affected by fires. And it was really something that hit home for me. I'm glad we had a chance to do that." Julie Baranowski, a Wayne State senior from Richmond, also returned for her second spring break in Detroit while many of her friends are in Cancun, Mexico. "Going to school down at Wayne State was hard for me when I saw homeless people and all the burned-down buildings," Baranowski said. "It was something I had never experienced before. It made me want to get involved and see what I could do to help out." The last few days have been hard ones for Traditionalists in the Episcopal Church. The House of Bishops is meeting in Texas, and so far they have deposed two traditionally minded bishops (kicked them out of the ordained ministry - even though technically they both had already resigned from ECUSA's HoB because they were received into another province of the Anglican Communion), brought charges to depose Bishop MacBurney (who was here at St. John's to ordain Fr. Fraser in January and who ordained me a deacon in 1994) for visiting and confirming at a parish in California that had left the Episcopal Church, and they were polling the house to find a way to have a trial to depose Bishop Duncan of Pittsburgh (my old bishop in my former parish) 4 months ahead of schedule in order to prevent him from going to Lambeth Conference (every 10 year gathering of worldwide Anglican Bishops) where he would exercise leadership on behalf of the conservative groups in ECUSA. And yet a bishop like Jack Spong, who outright denies the Resurrection and other core doctrines of the Christian Faith, continues as a member in good standing. The body of a Chaldean Catholic archbishop kidnapped by gunmen last month was found in a shal- low grave in northern Iraq yesterday.The discovery sparked an immediate response from Pope Benedict XVI. Speaking in Rome, he said the act offends the dignity of humankind.Archbishop Paulos Faraj Rahho was seized by gun- men on February 29, minutes after delivering a mass in Mosul, considered the last urban stronghold of al Qaeda in Iraq. and I realize that the devil is having a field day today. Trying to kill the biblical leadership in ECUSA, and physically killing an Archbishop in Iraq. And yet we remember that the blood of the martyrs is the seed of the Church. And quite frankly, throughout history, the scriptures have been proven correct - that we will be persecuted for righteousness sake (not self-righteousness sake, but biblical doctrine of revealed truth) and that leads to conversion. May we be ready to die for the faith that Jesus Christ is Lord - as he has revealed himself to us! As I was leaving for Seminary in 1991, an acquiantence from High School (he was an RC Priest at this time) told me these would be exciting times to be a priest because we were going to see martyrdoms happen - even here in America! And we should rejoice that we may get to offer our lives this way for the gospel! Perhaps Fr. Bob Tynski was right! Where has the Cathedral of Praise gone? In the past 7 years or so I have been observing the adventures of The Cathedral of Praise Church. I notice as these local churches pop up and move around, and one that caught me eye these years has been this Cathedral of Praise. I first noticed them when they were on Mack near the Chrysler Plant on Conner. The sign is still there - called Charlevoix Cathedral of Praise then. They then became our neighbors at St. John's - they rented the old Unitarian Church up Woodward, the handsome brownstone building on the other side of the Crossroad housing complex and next to the former Presby Church, now the Ecumenical Seminary. It is here that I met a member, who was doing some construction, and got a chance to look in at the dilapitated building. After a few months there, the moved up Jefferson Ave, into a former Church of God in Christ building near the Waterworks building. They were there at least a year. They then rented the former St. Columba's Episcopal Church, further up Jefferson near the Grosse Pointe border. I remember from the Diocesan Council notes that we had troubles with them paying their rent. Last Spring they rented a storefront on the corner of Alter and Kercheval. This is a former bar or bank, that had a short incarnation as a different storefront church - Word of Life. By Christmas it looks as if this storefront is abandoned again. Where has the Cathedral of Praise gone? And how do their members know how to find them when they move so often? And did any other landlord have rent collection problems? Does the State know how to raise your kids? Recently, the California Supreme Court ruled that parents have no right to homeschool their kids. In the best "Brave New World" fashion, the court reminded us of a 1961 ruling that the state knows the best way to not only teach your kids, but basically how to raise them. As the San Francisco Gate reports. Sorry - loyalty to God and family comes first and then to state and nation as it falls in line with the first two! As homeschoolers I sure am glad we are in Michigan, not California.